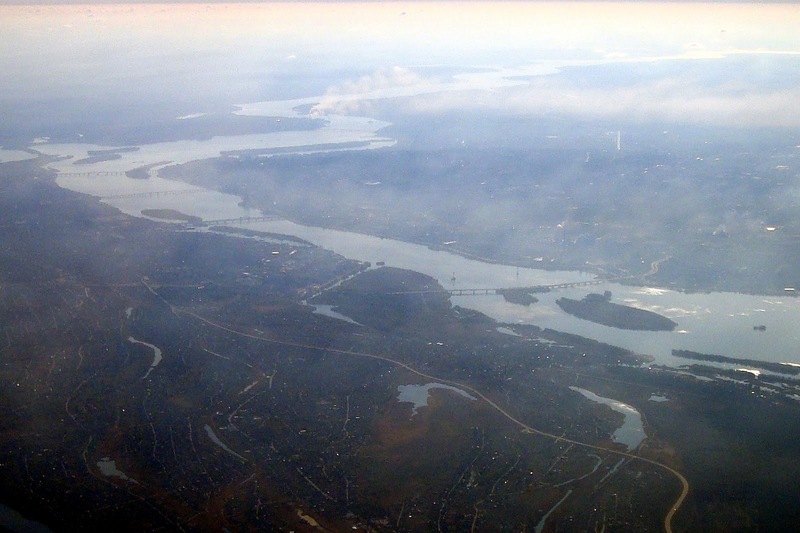 "We drink water from dear Dnieper - we will drink from Prut, Neman and Bug! 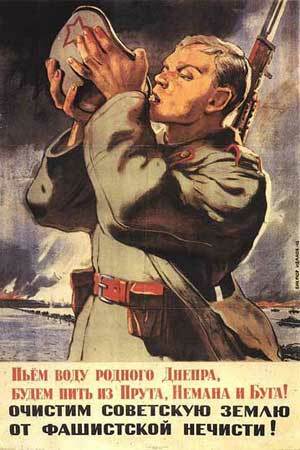 We will clear our land from fascists!" Poster artist, Victor Ivanov. Everybody knows the story of World War II: there was a lot of fighting, a lot of people died, and the Germans lost. Well, ok, they know more than that. It is when you start digging down into the real details, though, that all sorts of little oddities pop up. One of those was the Wehrmachtsloch. The Dnieper (also Dnepr) River was the largest natural obstacle in the Ukraine. Here it is shown during Operation Barbarossa in 1941. 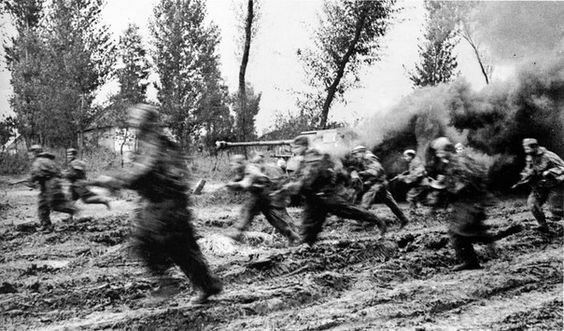 Following the Battle of Kursk in July 1943, the Wehrmacht was forced back by relentless Soviet hammer blows all along the southern half of the Russian front. Aside from a few transient counter-attacks, this continued straight through to May 1945. Hitler needed to stop them any way that he could, so he hoped to construct a military wall along the Dneiper River, the most formidable natural obstacle left between the front and Germany. The Germans hoped to stop the Soviets at the Dneiper, but that plan failed. In many places, the Soviet troops were across it before the Germans could even get there. The plan didn't work very well, but not because it was an inherently bad idea. In fact, the northern part of the wall, called the "Panther Line," worked extremely well. However, due in part to Hitler's refusal to permit timely withdrawals, but more importantly due to the valor of individual Soviet soldiers, in the south Russian troops were across the Dneiper before the Germans even had time to man it. 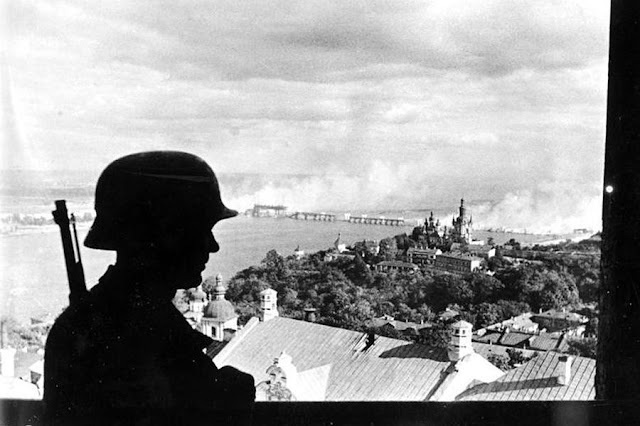 Kiev was lost in November 1943, and the battle continued rolling westward despite determined German counterattacks at places like Chernobyl. Soviet troops liberating Poltava on the approaches to the Dneiper River, September 1943. By January 1944, the only part of the Dneiper that the Germans still held in force was the Dneiper Bend at the extreme south of the river. Further north, the Soviets were closing in on the Polish border. Holding on to their remaining portion of the planned defensive line created a huge bulge to the east which sucked in German troops as the Soviets launched attack after attack to dislodge them. 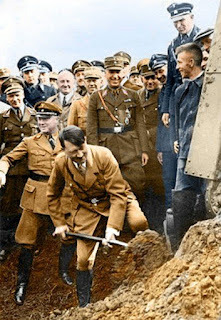 Hitler refused to give up the region, and he did have his reasons: it was a very productive area rich in natural resources. General Erich von Manstein was in command of Army Group South until the end of March 1944, at which point Hitler dismissed him "because the days of grand operations are over." Army Group South under the command of General Erich von Manstein tied in with Army Group North (General Ernst Busch) in the swampy region known as the Pripyat Marshes northwest of Kiev. Fourth Panzer Army, which had lost several divisions at Stalingrad and had just lost its veteran commander, Hermann Hoth, at Kiev (dismissed by Hitler), held the northern-most sector of Army Group South. Throughout the war, these army group junctions were weak spots in the line, which everybody knew but nobody really did much about. When under pressure, troops would retreat in the direction of their headquarters, which at the tie-in points lay in opposite directions. This would create a weak seam which the Soviet troops anticipated and repeatedly tried, with success, to exploit. The Soviets always knew where the German formations began and end from their network of spies, captured Wehrmacht troops and simply observing German markings. Troops of the First Ukrainian Front on a T34-85 in Gleiwitz about a year later. The Soviets brought pressure by First Ukrainian Front and 3d Guards Tank Army against LIX Army Corps, a weak unit with just one full division, the 291st Infantry Division. It was located on the extreme northern portion of Fourth Panzer Army, which held the northern part of the Army Group South sector. It was a common Soviet tactic, to mass overwhelming power against a weak link in the German line, and it worked once again. Once on the move, the German Corps followed the usual pattern and retreated south toward its supply line. It justified this move by pointing out that the marshes right behind it were natural obstacles that would hold up the Soviets anyway. It also had the mission of defending the cities of Shepetovka and Rovno just to the south, which it did successfully for a while. 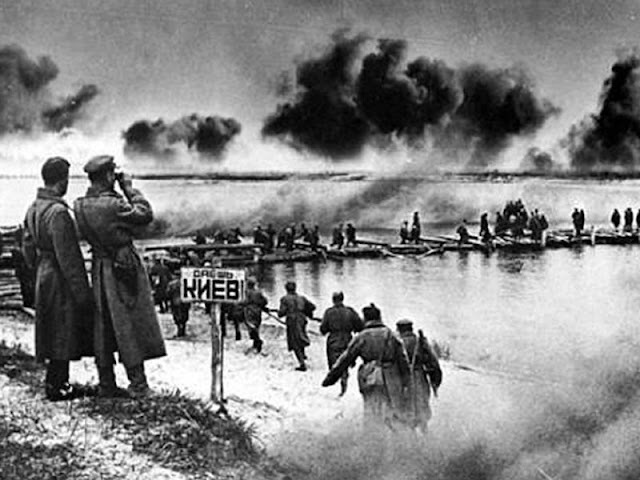 Soviet troops crossing the Dnieper. The sign says "This way to Kiev!" The German Second Army at the southern extreme of Army Group Center, meanwhile, was already defending within the marshes, so it was not an impossible place to maneuver. The German troops retreating south were just coming up with excuses, and this was not so uncommon; historians who blame all of the Wehrmacht's struggles on Hitler tend to gloss over such details. In any event, once the LIX Corps broke contact, the Second Army also pivoted away from the Soviet advance to give flank protection both to itself and to the rest of Army Group North. This created an open corridor to the West for the attacking Soviet troops. Basically, soldiers on both sides of the seam began looking out for themselves and their own interests. It was every man for himself. 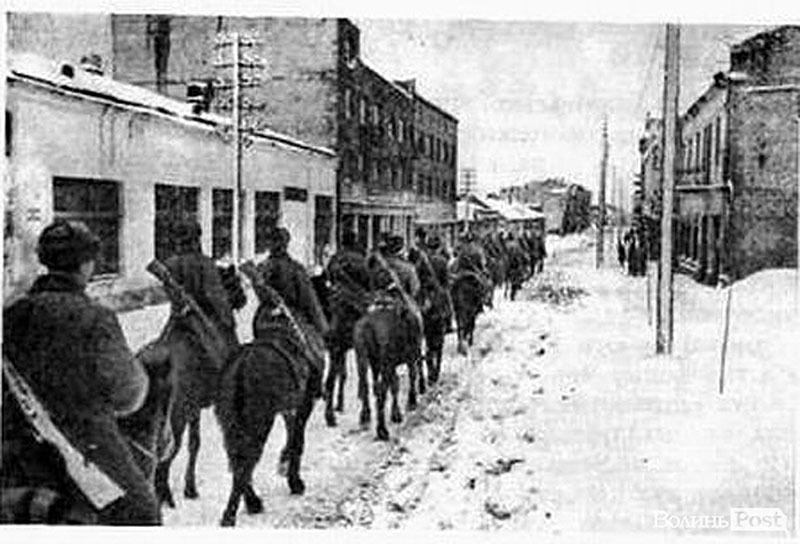 Soviet troops entering Lutsk, Ukraine. The result was a widening breach between the two Army Groups. Eventually, it reached a span of 110 miles, which is large even on a front that never was less than 2,000 miles long. Neither army group could spare troops to fill it, and there were no armies in reserve. Someone came up with the name "Wehrmachtsloch," or "military hole," for the gap, which gave the whole incident a kind of legitimacy. "Oh, the Wehrmachtsloch begins here," one could say when pointing to the map, as if it were another army group all its own or a mountain range or something and everything was normal. The marshes were rough terrain, but they weren't that impenetrable; the Soviets navigated them well enough. In addition, they were crawling with partisans only too willing to help the Soviets navigate the swamps. 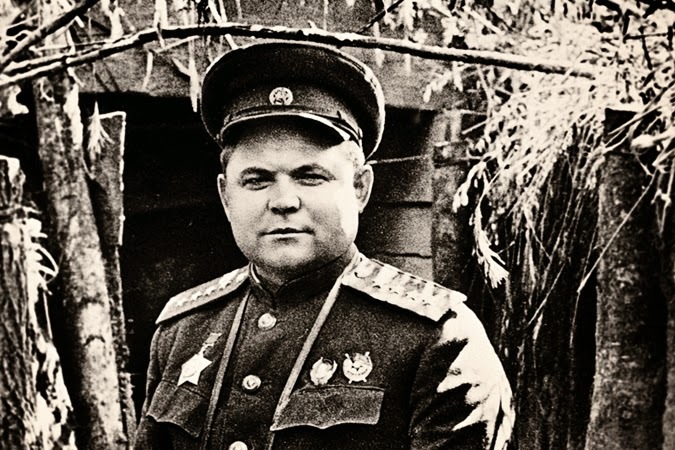 General Nikolai Fyodorovich Vatutin was ambushed by Ukrainian nationalists (sound familiar?) in February 1944 and died six weeks later. The Soviets, as usual, were quick on the uptake. Belorussian Front (which became 1st Belorussian Front on 15 February) joined in the attack and pushed the Army Group Center formation, Second Army, further north to a line along the Ipa River - weak German forces invariably sought the nearest river to establish a defensive line, and the Soviets were fully aware of that, too. 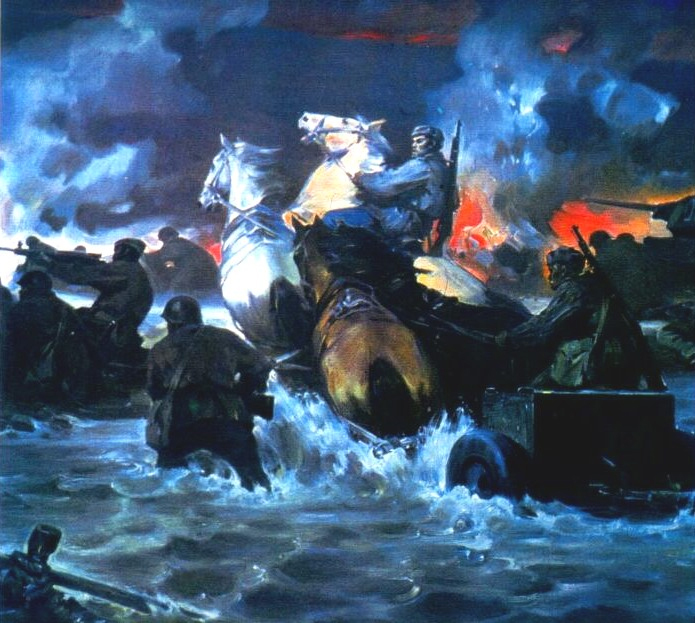 The only thing that saved the German line from breaking completely from the wedge driven into it was the fact that the January weather was mild and the marshes had not frozen solid, which would have permitted large-scale tank movements. Still, General Vatutin in command of Belorussian Front sent two large forces into the gap, First Tank and Fortieth Armies. The second battle of Kharkov in May 1942 illustrated the classic example of German forces holding tight the corner posts and then later sealing off the enemy eruption (along the red-dashed line). The tactic did not work with the Wehrmachtsloch. The stage now was set for a major event. Either the Soviet forces would destroy the entire German line from both sides, or themselves run into trouble by over-reaching. It was a large gap in the German lines, but a favored Wehrmacht strategy throughout the war was to hold on to the "corner posts" on either side of a breakthrough and then use all means possible to close the gap and trap the invading force. 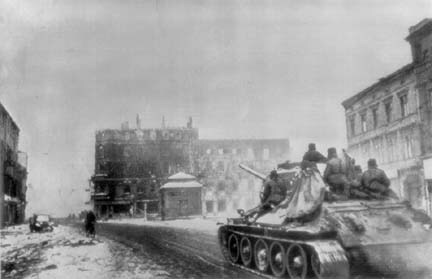 That tactic had worked brilliantly at Kharkov in May 1942, when the Germans captured hundreds of thousands of Soviet soldiers by sealing off a breakthrough (another example was in the north in 1942, when the Germans similarly destroyed Second Shock Army and captured General Vlasov). As the war dragged on the tactic worked less and less, but it was Hitler's pet tactical technique. The German Generals didn't believe in repeating the same tired strategy over and over, because it wasn't fooling the Soviets - but Hitler continued ordering it. 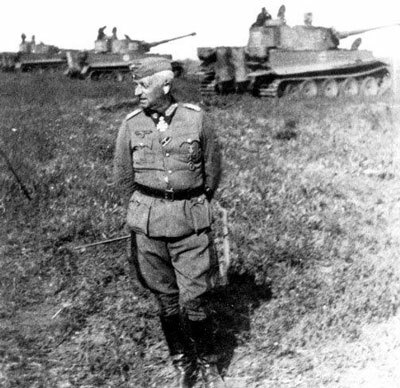 General Hube in command of 1st Panzer Army was surrounded due to the formation of the Wehrmachtsloch, but fought his way out. Fortunately for the Germans, General Manstein still had some operational latitude. He adroitly protected the rear of the German formations that were facing east but now being attacked from behind by moving some troops off from quieter sections of the front. Hitler, though, started interfering. 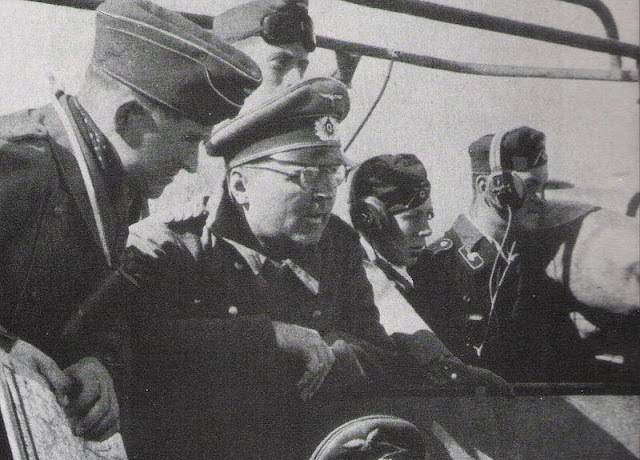 When Manstein began moving troops off the front further south to meet the threat, Hitler forbade any retreat there and prevented several formations from acting. A few units were brought in from the West, but they took time getting into place. It was a huge street brawl with everyone fighting for their lives. The arrows on the map on this paper shows the Soviet strategic mistake: they headed in different directions through the Wehrmachtsloch and did not focus their strength to finish off the nearby German troops. This gave the Germans time to recover. The entire southern portion of the German line became unhinged, a giant agglomeration of globs of strength fighting independently for survival. The Soviets, though, had their own issues; throughout the war, they showed a consistent inability to fully exploit breakthroughs in the German line, and this time was no different. Their troops headed off in all directions into the limitless expanse of the woods and forests and lost momentum. Stability only was restored after a general withdrawal deep into Poland. The Wehrmachtsloch would remain in place for months, during which the Soviets would encircle two German Corps near Cherkassy and the First Panzer Army under General Hube. Elements of the former and the entirety of the latter would escape, and the Soviets were unable due to the weather, terrain and relative balance of forces to fully capitalize on the situation. However, the rigid thinking that had caused the issue in the first place remained a problem for the Germans for the remainder of the war. V. Shatalin. Fight for the Dnieper River.